More than anything else, Indigo Russell longs to fit in. And if she can’t accomplish that, then she’ll settle for fading into the background, which she’s managed to do rather well over the last couple of years. To most of Ridgemont High, she’s just another teenager walking the halls, doodling in her notebook during class, never raising her hand. An average student. That’s what she’d like you to think. But Indie isn’t average; she’s different. She has visions, visions that allow her to see into the future and back again. Only her family and best friend, Lacey, know about them. But when she sees Lacey’s boyfriend with another girl, Indie has to decide whether to trust her instincts or her friends. As she grows closer with John, an enigmatic loner who recently transferred to her school, the visions intensify, threatening not only to alter the lives of others, but also to expose her well-kept secret. "Don't", I whispered. "Don't talk to me. I just want to be a normal seventeen-year-old. I want this all to go away so I can have a boyfriend. Sometimes dead people appeared in my room uninvited. Just like my visions appeared in my mind. Then I saw him. He was alone, leaning against the counter, holding a red cup. He looked so out of place, exactly how I felt. I could see nothing but white. No, please, no. Not again. On the surface, Indigo Russell is just an average teenager. She doesn't stand out in a crowd. She's a decent student who prefers to lay low and not draw too much attention to herself. There's nothing special about her. Well, other than the fact that she is psychic. Except for her family and best friend, Lacey, no one knows about Indigo's visions of the future. Afraid to be misunderstood, judged or simply called a freak, she keeps it all a secret and tries her best to blend in. When in one of her visions Indie sees her best friend's boyfriend cheat on her, she doesn't know how to handle the situation. Should she tell Lacey? Is this the right thing to do? On top of that, Indie's visions become more and more frequent when she meets John. And they show her things she never wanted to see. Things that will torment her and affect her life and future in many ways. All the characters in this book were very interesting to read about. I liked Indigo from the get-go and found myself relating to her in many ways. She's a likeable character. Vulnerable, sensitive to other people's needs and feelings, quiet, caring and thoughtful, she's a very complex heroine who has some pretty tough decisions to make. She struggles with her psychic ability - in both physical and emotional way. Her thoughts and feelings are the primary focus of the story and they are explored in-depth, with amazing sensitivity and accuracy. There were moments when I felt slightly frustrated with some of her decisions and actions, but at the same time I always understood what motivated them and that's what made this book for me. Other characters - especially Lacey and John - are well-drawn, too. Reading about the dynamics of Indigo and Lacey's friendship was fascinating and emotionally affecting. The bond between them was very strong, they genuinely cared about each other, trusted and supported one another every step of the way. Their story really moved me. Lorna Schultz Nicholson's writing was nothing short of excellent. Reading this book was such a pleasant experience, I honestly wish I had time to sit down and read it all over again. The story flow was effortless and the pacing was nice. All the dialogues, as well as Indigo's inner monologues, were convincing, vivid (but not too angsty) and realistic. To be honest, I didn't know what to expect when I picked this book up. I definitely was not prepared to be totally and utterly blown away by it. Within minutes, I was fully immersed in the plot and frantically turning pages. I did not want this book to end (insert: deep sigh) and felt sad when I hit the back cover. It was such a phenomenal reading experience and one that I will remember for a long time! I highly recommend getting yourself a copy of this book. You won't regret it. It's an intelligent, insightful and very enjoyable read full of riveting emotions and interesting observations about life, love, family, friendship and one's identity. After reading a digital galley of this amazing book, I went straight to Amazon to order a physical copy - it was THAT good and I knew I will want to re-read it at least once in the future. Don't hesitate to pick it up. You'll be surprised at how much you'll love it! I just finished reading this too - my friend Lorna Schultz Nicholson wrote it with Tara (I LOVE Lorna's other young adult books too - check out her podium series). Lorna's a great writer and it was exciting for me to see her back in the mystery (mysterious?) fiction again! Love how she managed to work with Tara to nail the psychic stuff so well! I was interested in this based on another review but this confirms my interest even more! I love when books surprise you so much! Here? I had no idea what this book was about, but your review totally made me want to pick it up! This sounds really great! I always discover new books I hadn't heard about before from your blog. Thanks for the fab review hon!! @Deborah Yay, thank for letting me know about the Podium series, I will most definitely check it out :) Thank you for stopping by! I always want to go out and buy a book after reading your reviews. Which I will tomorrow. I just really enjoy your reviews. I can't wait to try for a giveaway! I really enjoyed this as well! I love stories with abilities like this and it felt realistic to me which I loved. I cant wait wait to read more! @Evie. This is Lorna Schultz Nicholson the writer of Through Indigo's Eyes. AND I am so appreciative and humbled and flattered with your review. I loved writing this book. Your kind words mean a lot. And about my Podium series that Deb mentioned. It is a sports series written for reluctant readers so hi concept, lo vocab. So needed in the inner city school libraries. Can send you copies if you'd like!!! Thanks again! I hadn't heard of this book before reading your review. 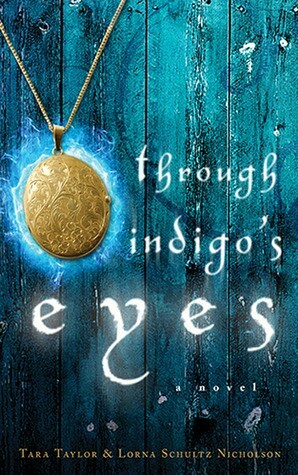 After enjoying your insightful and thorough review, I'm looking forward to reading Through Indigo's Eyes. Sounds fantastic! Thanks for sharing and for a great review! This one sounds very cool. It would be so weird to have unexpected visions of the future. That's one magical power I'm not sure if I would enjoy having. This sounds like an interesting read about the emotions that would go along with that. I love the title of this one, and I love the name Indigo. The synopsis sounds wonderful. And I love your review. I definitely am going to check this one out. It really sounds like a great read.